Stitched Together: Knotted Cap KAL - Let the fun begin! Knotted Cap KAL - Let the fun begin! The populous has spoken - the Knotted Cap pattern is the winner in the Hat KAL voting. To get your Knotted Cap pattern, buy now and enter your discount code of JAN13KAL. This will give you a £0.50 discount. This discount is live now until midnight on 20th January 2013. So far, we have 8 people joining in on the Stitched Together Design Group on Ravelry. It would be great, if you want to take part in the KAL, if you could join us on the Group Thread, so we can chat easily and share pictures as we go along. I am setting a deadline for this KAL, because I want to offer a prize this time. The deadline is midnight (UK time) on 3rd February 2013. This gives you four weeks, which should be more than enough, even when working on other projects. post onto the Stitched Together Group thread, a photo of your finished hat, or a link to your project or blog post showing your finished hat. post a photo to the wall of the Stitched Together Facebook Page of your completed hat. NOTE: If you knit a Stitched Together Designs hat, other than Knotted Cap, during this period, you can still join in the KAL and enter your completed hat in the draw, but you won't get the pattern discount. The prize will be a Stitched Together Designs Pattern of your choice, gifted to you electronically via Ravelry, though you don't need a Ravelry account to receive it. 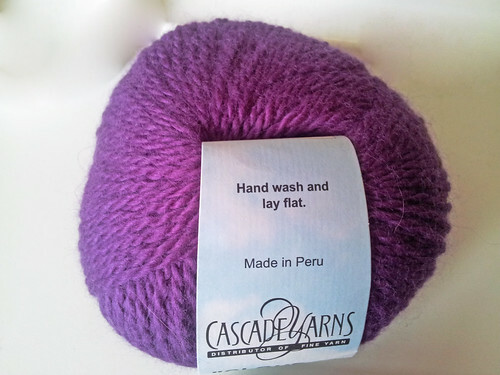 There will also be two skeins of Cascade Cloud 9 in colourway 182. This lovely yarn would be perfect for knitting a Handyman's Hat pattern. It is an aran weight made of 50% angora and 50% wool with 109 yards per 50g skein. In addition to the above prize, is a skein of Posh Yarn Hannah in the "Another Year Gone" colourway. Posh Yarn have very limited runs of colour. There are probably only another 5 skeins of this particular yarn in, in this colour, existence, so it is pretty special. It is a sock weight yarn, made of 80% merino, 10% cashmere and 10% nylon. 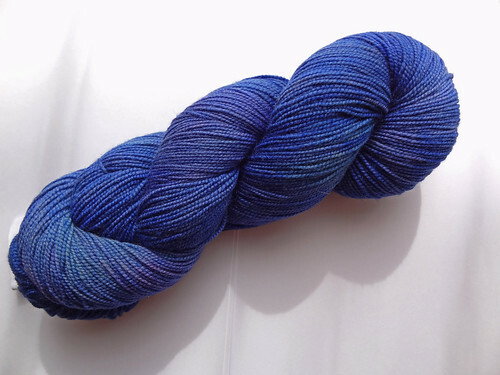 There is 400 yards in this 100g skein. 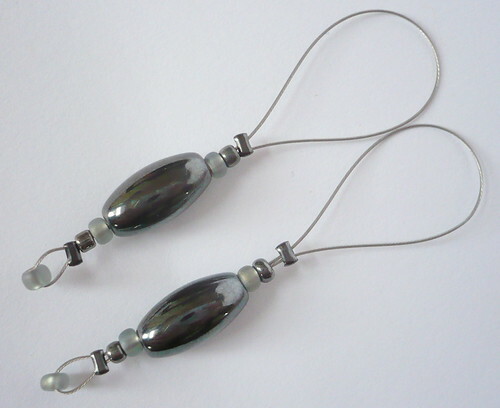 I will also make some stitch markers for you too. I have perfected my technique for making them now, so you will have the benefit of pretty markers that don't catch your yarn and will fit on most sizes of needle. Here is an example of some I made last year. I will discuss your bead preferences after the drawing. I hope you find these prizes to your liking and they will encourage you to knit your hat by the deadline. I look forward to seeing your progress, on the Facebook Page, Flickr Group or Ravelry thread.